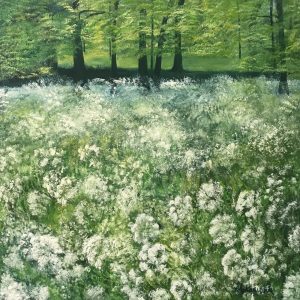 I’ve been fairly busy, this is my latest new painting ‘Cow Parsley, Priory Park, Reigate’. I absolutely love Cow Parsley, its so wild and abundant and grows everywhere, like a covering of summer snow. I love the background of Cow Parsley, which always seems to be an intensity of glowing greens. Just stunning. This is ‘Passion’, an abstract oil painting. I used to do quite a lot of paintings like this in the days of my Artfulness gallery. 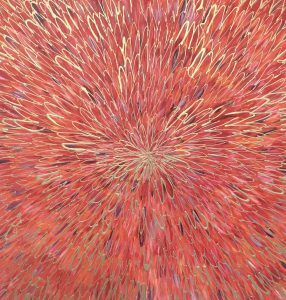 I like the explosion of colour, the reds and gold together, this would give an amazing splash of uplifting colour to any dull room. 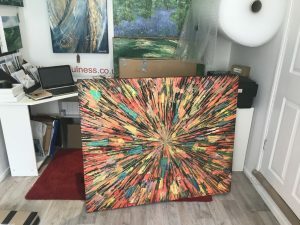 Another huge, 100cm x 120cm ‘Explosion’ commission has been posted off to York. I’ve got my fingers crossed that it will arrive safe and sound at its new home today, after Parcel Force flailed to deliver it on time last week, when they were a day late, the customer was out! The next earliest day he could be in to receive the painting was today. I just hope it hasn’t been damaged whilst in storage for such a long time. Let’s hope all is well!! And finally, massive breaking news! I actually managed to do some painting from life. 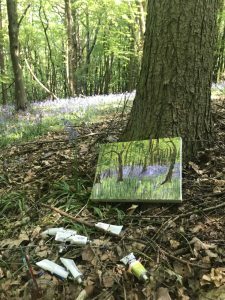 I sat in the forest at Priory Park and for a couple of hours attempted to paint the bluebells from life. It was a wonderful experience, even if I’m not that happy with the painting itself yet, though I’m sure I can continue to work on it in my studio. 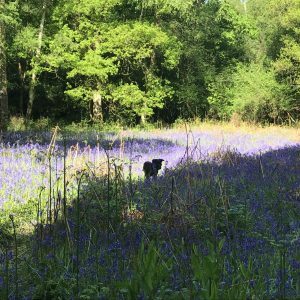 I looked after my brother’s puppy Bonnie last week too and really enjoyed walking her amongst the Bluebells as well, just gorgeous.